Roy Moore, also known as the Ten Commandments judge, is gaining ground in his bid to make a comeback as Chief Justice of the Alabama Supreme Court. During the Republican primaries earlier this year, Moore won the nomination in a landslide vote, even though his opponents had outspent him six times over. It was said that the reason for his win was that the evangelical community rallied around Moore at the polls, while those who did not identify as Christians decided to skip the primaries. Nonetheless, Moore appears by all indications and reports to be on track to regaining his seat from which he was ousted nine years ago. The controversy began in the early 1990’s when Moore was serving as a circuit judge in Etowah County, Alabama. After he placed a wooden plaque of the Ten Commandments on the wall behind his bench, a defense attorney in a case involving two male strippers that were accused of murder began to vocalize a disdain for the display. After drawing attention to the plaque, others also decried the prayers that began each court session. In 1993, the American Civil Liberties Union (ACLU) sent a letter to Moore, threatening to sue if he did not stop opening the court with prayer. When he refused, the ACLU filed suit against the judge, both for the prayers and his Scriptural display. “What they’re coming against is not me, but … against truth,” he said. Initially, presiding federal District Judge Charles Price ruled the prayers unconstitutional, but allowed the Ten Commandments to remain. When opponents of Moore pressed the judge to reconsider the ruling, he issued an order demanding that the Ten Commandments also be removed within 20 days. Moore again refused. “If the feds want this plaque down, tell them to send U.S. Marshals to tear it down,” he declared. He appealed the ruling to the Alabama Supreme Court, who issued a temporary stay, but eventually disposed of the lawsuit in 1998. 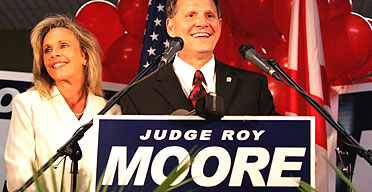 In 2000, Moore ran for Chief Justice of the Alabama Supreme Court — the same authority that had disposed of his lawsuit. Upon winning his bid and setting up his office in the courthouse, he arranged for a two-ton granite monument of the Ten Commandments to be displayed in the building’s rotunda, which was installed the following year. In doing so, Moore was pointing back to recent decisions from the United States Supreme Court, which stated that the Ten Commandments could be displayed on government property as long as they were soley for historical or legal purposes, and not for the promotion of the Christian religion. The Supreme Court had ruled that two county courthouses in Kentucky must remove their displays because the there was a religious motivation behind their posting. In light of the ruling, District Court Judge Myron Thompson then ordered Moore to remove the Ten Commandments from the courthouse rotunda within fifteen days. Moore again refused, but the monument was later moved to a room that was not open for public viewing. On August 23, 2003, a unanimous panel of the Alabama Court of the Judiciary removed Judge Moore from the bench. Watch footage of his trial and removal below. With Moore’s latest bid for Chief Justice, he appears to be in position to regain his former seat in the state’s highest court. Garnering 51% of the vote in the primaries compared to a mere 25% gained by his opponents was a hopeful sign of victory for the unabashedly Christian candidate. In addition to campaigning and raising support through his website, Moore is currently working with his legal organization, the Foundation for Moral Law, to fight for the rights of a small town in Alabama to post Scripture on its welcome sign. The legal challenge is one of a number of cases that Moore has been helping with since being removed from the Alabama Supreme court. Moore will square off against Democratic candidate Harry Lyon at the polls in November.